Who uses proxy for SEO? The use of proxy for SEO is common around the world. It is not only the business marketing but also remaining silent about your ventures. These ventures are the ones when you browse through the webs of your competitors. 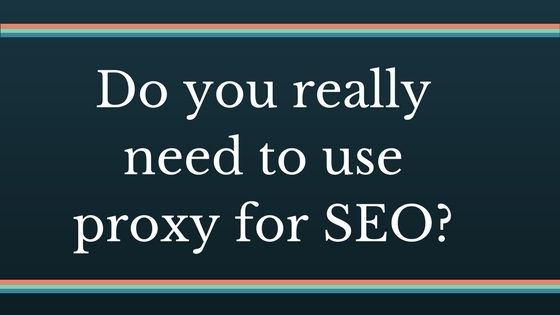 Ranging from large businesses to the small enterprises, everyone uses a proxy for SEO. It is not a question about who, why and what. Instead, it is about how well you use the proxies. Finding out the best keywords and seeing what your contenders are using is a great motivation. However, if you keep browsing through the webs of your competitors, they may detect you. Chances are that they may even block your IP. This is where the proxies come in. All your tasks can be efficiently covered. Also, the proxies will remove your tracks from the internet. So, it is best that you use a proxy for SEO. Microleaves has been successfully providing a variety of proxies to all its users. The use of proxy for SEO is no different. This website has it all covered for the users. You will not only find a variety of packages, but also a great experience. Choosing to use a Microleaves proxy for SEO can be the best decision you ever make. These proxies are highly reliable and also very efficient. Like every other proxy, these proxies enable you to surf safely. Since the website cannot detect you, they cannot block you. Knowing that you are safe is the best motivator for working better. You can surf safely for hours without the fear of detection. Moreover, the website cannot mark you as spam if they cannot detect you. Also, you can use websites which are banned in your country. This enables users to get more information about the overseas clients. What they are looking for and what they expect. The use of proxy for SEO ensures that you become a master of your trade. There have been a lot of positive reviews for proxies. The use of proxies has enabled a number of marketing experts to increase their efforts. The proxies provide a safety net to the users. Browsing undetected can help in gaining a lot of information. Also, you can get your hands on information that is not available in your region. The positive experience of the users motivates others to buy proxies too. The reviews for the proxy usage have been the biggest motivation for new buyers. Enhanced browsing and better connectivity is a desire of all companies. The SEO enhancements make sure that users stick to the proxy usage. This helps them remain upbeat in the markets. After all, the business competition requires an edge for ensuring success. In a nutshell, using a proxy for SEO is highly advisable. All the business around the world largely relies on promotion. In promotions and marketing, competition is a huge factor. To gain an edge over the competitors, one has to use proxies. This enables users to browse safely. Also, you can go through your competitor’s web and analyze it in detail without being detected. All this can come with your decision to be safe. Therefore, the use of proxies is highly advisable. Next PostNext How Backconnect Proxy Residential Is Helpful For You?